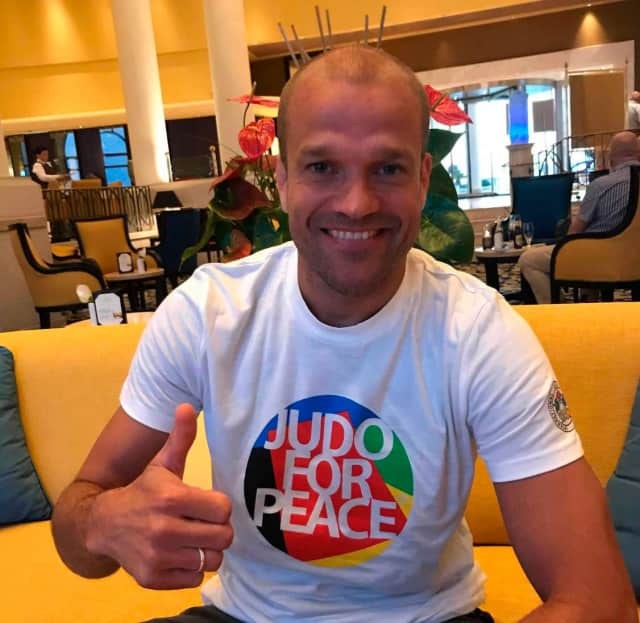 Ruben Houkes (born 8 June 1979) is a Dutch judoka who won the -60kg world title at the 2007 World Judo Championships in Rio, Brazil. In 2008 he became an Olympic bronze medallist in Beijing. He is today the leader of the IJF Judo for Children/Judo in School programmes. We met him ans asked him what does motivate him to keep transmitting the values judo that he learned by practicing the sport. When did you start judo, where and why? I started judo when I was 5 years old. My parents wanted me to do judo, because I hated losing and was very energetic. Or let’s say I was too energetic and couldn’t stand losing. In the Netherlands judo is perceived as a pedagogical sport. Parents think that it’s good for children to practice judo for some time. Did you practice other sports and why did you choose to get involved in Judo? I practiced gymnastics for three days (smile), but I didn’t like it so much. Besides that I was always playing outside. I loved soccer and basketball. But Judo definitely bacame the one sport. The peak of your career was in Rio 2007 and later in Beijing 2008. How did you reach that level and what did it represent for you at that time? For me it was all about dedication. I loved the game. I loved training. I loved the group of people who were on the same journey. But it wasn’t always easy. I didn’t manage to go to the Athens Olympics by one point on the ranking. That was really tough. Cor and Maarten (my coaches) convinced me to continue for one more Olympic cycle. Being world champion in 2007 was too big to understand. Later it felt better. And more real. You started the Judo for Children initiative in 2005, while you were still competing. Why did you make the choice to take care of the grassroots level? I can’t believe the way people behave nowadays. In today's society it’s not normal anymore to listen, to respect, to work together. And if you look at the fundament and future of our society, children, in my opinion it is necessary for them to get acquainted with judo and its values. I wanted to do something back for society, so I started the Schooljudo program in the Netherlands, with the ambition to make judo part of the curriculum of every primary school. You build the programme with Ziggy Tabacznik. What were the goals of it? Our mission is that every children who leaves primary school had to practice judo in school, to learn about the values and to know how to practice it in life. Tell us about the process to go from one school and a few dozens of children involved to today’s extensive programme? From the start we knew we had to be different than all other sport programs. So we created a brand, Schooljudo, with a strong philosophy. Our team lives according to those values. We amplify the judo values on the tatami, but also in any other aspect of the program. We promise the primary schools that we will change the dynamics in the classrooms and make the children more resilient. Our goal is not to teach them a o-uchi-gari. Judo is our tool to build skills for life. We started to invest in the materials and today we have 412 locations in the Netherlands. And more than 40.000 children involved every year. How did you go from a national programme in the Netherlands to the international level? The International Judo Federation is already doing amazing things around the world for children and in schools. The judo DNA is universal. After a meeting with President Vizer we talked about implementing our knowledge and support to the world, to make sure we are spreading the moral code around the world in schools. It’s an honor to work with the IJF on this. What are the aims and goals of the Judo for children/Judo in Schools programme at the international level? Our goal is to have judo as a value based program implemented in every primary school around the world, in order to build a better society. In 2011, Ruben Houkes gave his judogi to the Pyramid of Judogi organized together with the French Judo Federation. All the collected equipments were offered to development programs. What inspires you today to keep developing the programme? The daily feedback from classroom teachers, partners and judo trainers about the value of judo for children inspires me! What is the importance of proposing judo to young people? It’s in the nature of every child to wrestle around. They love to frolic. In my opinion it’s important that we (as trainers) make sure they love it. They smile. They fool around. Within the boarders of judo. Subconsciously they will learn about the values. And we will stimulate them to continue. In our program therefor, we call judo trainers ‘entertainers’. A combination of fun and training. For instance we now work with Walt Disney for (new) storylines we can use on the tatami. Tell us a bit more about your approach to teach judo? In primary schools the children are obliged to participate, when in a club it's a choice. We need to make it as fun as possible to create a positive mindset. If this happens we are confident we have a great fundament for our goals. How do you see the programme expending in the future? I hope that together with the IJF we will create more strong and sustainable programs around the world. And that in the next 10 years we can proudly say that judo is part of primary schools (before, during or after schooltime) in a lot of countries. The main partners are the national federations (NF). How do you work with them? What do you propose them to implement? The NF’s are very important. They are the linking pins to the judoclubs and judoteachers. We offer them tools, lessons, support and knowledge so together with them we build strong structures. This includes structures for judotrainers, judoclubs and primary schools. How to you see the interaction with other IJF projects such as Judo for Peace, Gender Equity, Judo for All…? How does that contribute to the global Judo for the World programme? All of these programs contribute to the main goal: Building a better society. The people involved have a lot of expertise. We are learning from each other and still can learn a lot from each other. It’s nice to see the energy and the eagerness to add value to the world. What are today’s needs in terms of developing the Judo for Children/Judo in Schools programmes around the world? We see that the values of judo are important in every country. And that primary schools are looking for effective ways to learn kids about these values. Creating a worldwide framework for primary schools will be effective.